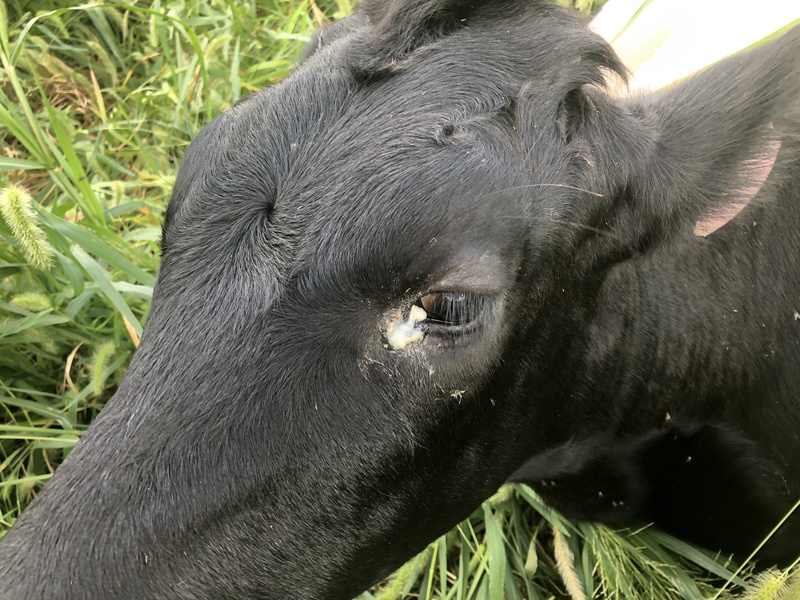 Calf (about five months) with discharge out of her eyes. 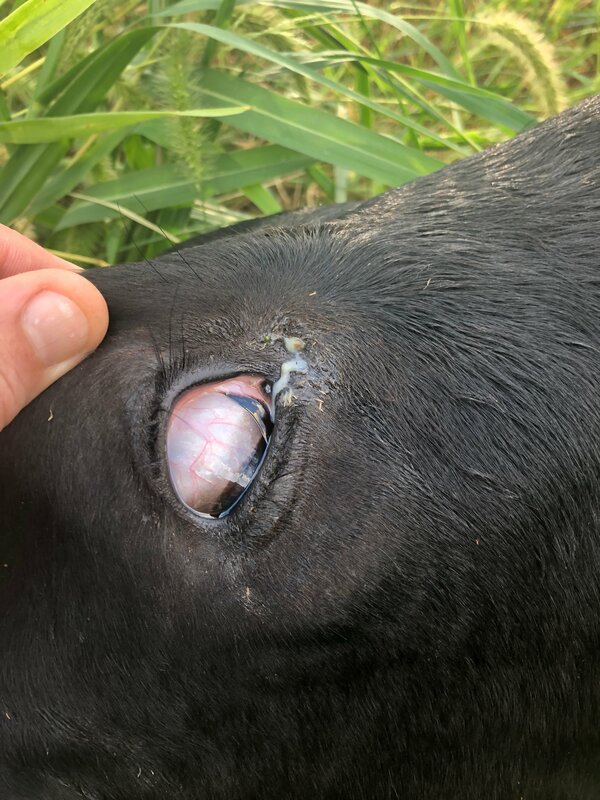 Calf (about five months) with white discharge out of her eyes. Will post a picture. 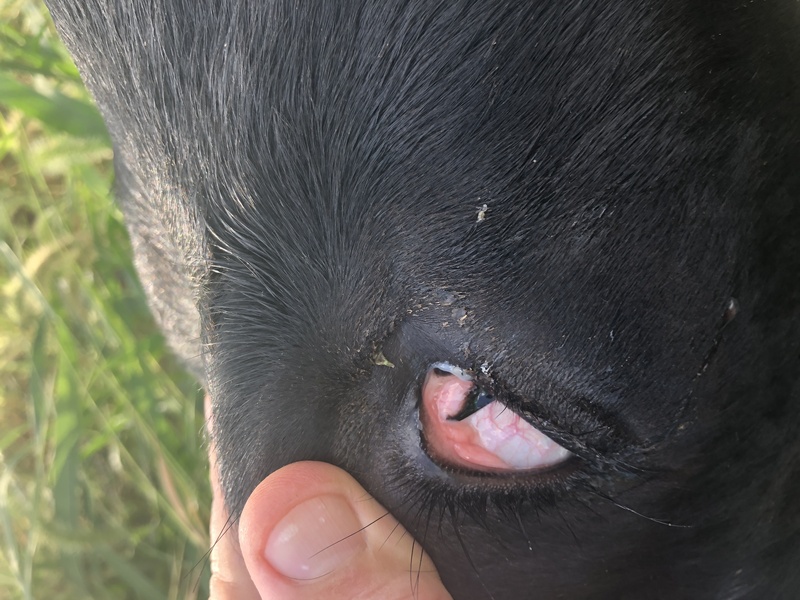 She does not seem to have pinkeye symptoms and can see fine (she runs around still). I gave her about 12ml of sub-cu Duramycin 72-200 in case I was wrong about pinkeye. I wondered if she has gotten some kind of injury or . . .? Thoughts/course of treatment? Sorry there weren't any large animal vets on earlier. I actually started to answer on your last post right before you closed it. Give me a second to type my answer back up! No problem. Looks more like conjunctivitis and discharge from the naso-lacrimal duct to me. Basically, I'm thinking it's actually early-stage respiratory disease, it sometimes shows up in the eyes like that. 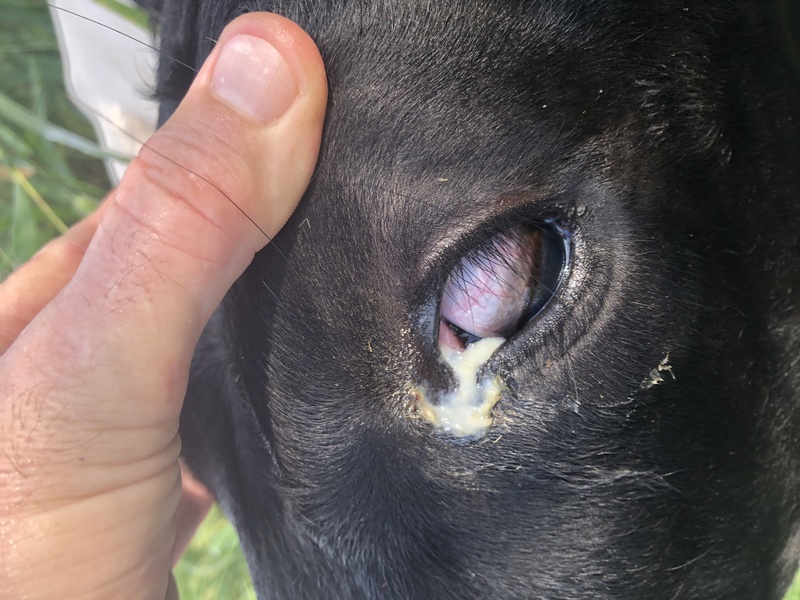 The duct I mentioned actually connects the sinuses and respiratory tract directly to the eyes, which is why we get eye discharge in respiratory/pneumonia cases. Obviously he doesn't have much pneumonia yet or you'd know, but we might be in early stages. I agree, doesn't look much like pinkeye, the corneas still look good from what I can see. Oxytet (the right treatment for pinkeye) probably isn't my first choice for respiratory/pneumonia, but it might help a little. I would recommend waiting a couple days, as since it's an early enough case, the oxytet might be enough to clear it up. However, if it isn't better soon, I wouldn't wait too long. We don't want this getting down into the lungs. I would recommend something a little more broad-spectrum, something you would use for pneumonia. Without any more information, I would probably reach for Enrofloxacin (Baytril) to start. Other options might be something in the macrolide class (Draxxin, Zactran, Zuprevo, etc.). Of course, legally I have to recommend your local vet examine the calf, but this is how I would normally go about it. That is really surprising. How’s she get pneumonia? Do these meds require a prescription?What are the signs of respiratory disease? Of course you have to understand I haven't actually evaluated her, just my best guess based on the pictures. 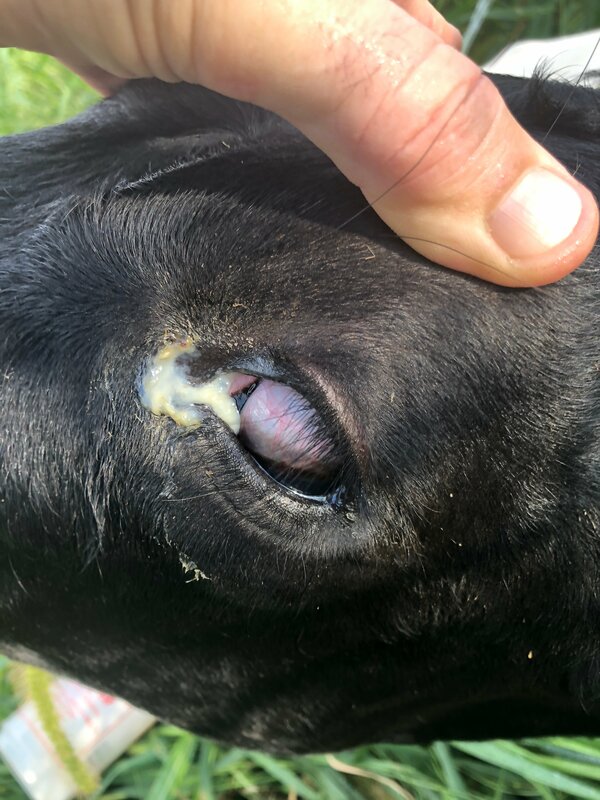 Respiratory disease is very common in calves, they get what's called the "Bovine Respiratory Disease Complex". It starts because they get viruses similar to a cold/flu, which lowers their immune system and can turn into pneumonia. I certainly doubt she has full-blown pneumonia yet, just something to watch out for. Early stages are just lethargy, lack of appetite, and maybe breathing a little louder/faster. In severe cases, she would be breathing with an open mouth and maybe drooling/foaming at the mouth. I don't mean to alarm you, and certainly don't expect this to happen, just examples of things to watch out for. Unfortunately yes, they require a prescription. 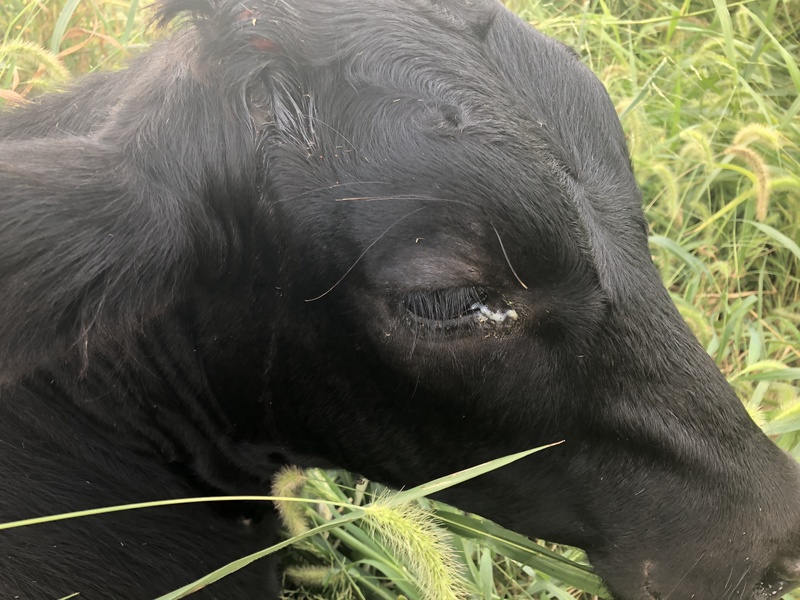 However, they are common across many large animal species, so any local veterinarian should have one of them, even if they're not familiar with cattle. If getting any of these is not an option, don't panic. You caught it early enough, the oxytet may be enough! I would recommend repeating the oxytet daily for at least 2-3 days to see if that will clear it up. If you're seeing improvement, continue until symptoms are gone. Ok. I gave her the duramycin about 10 days ago as a single dose. She seemed fine, the discharge decreased and then today I saw this. Should I give her a new course of that for a few days, same amount? Ok, that's a good sign that whatever it is may be susceptible to the duramycin. I would start it again, for a minimum of 3 days, or until all cleared up. How much would you estimate she weighs? I would say for a repeated dose protocol, you could cut it back a little. Maybe 8cc/day. Happy to help. If anything changes or any other questions, check back in! Will do—any difference with subcutaneous vs in the muscle? Not with oxytet. Either way should be fine. I would say IM probably preferred, less chance of there being a reaction at the injection site. Good Evening Dr, I have a Cow who had a still born last night.